Born 2 October 1857, Glasgow, Scotland. An acclaimed radiologist and pioneer of the use of X-rays as a therapeutic tool. John Macintyre (1857-1928) was a graduate of the University who became a pioneer of radiology. He was a lecturer on Diseases of the Nose and Throat and awarded an LLD in 1920. Born in Glasgow's High Street, Macintyre's father was a tailor and his mother a relative of the missionary and explorer David Livingstone. 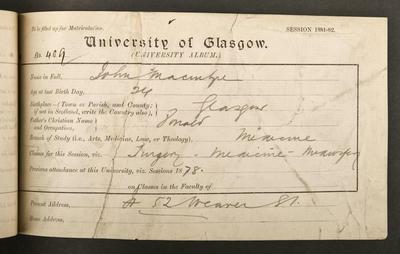 He became an apprentice electrician before matriculating to study at the University in 1878, graduating MB, CM in 1882. After working as a ship's surgeon and in London, Paris and Vienna, he before returned to Glasgow as Surgeon for Diseases of the Throat at Anderson's College Dispensary. Macintyre established a lucrative private practice in the city, specialising in the treatment of actors and singers. Macintyre was fascinated by the potential uses of electricity in medicine and in 1885 he was appointed Consulting Medical Electrician to Glasgow Royal Infirmary. 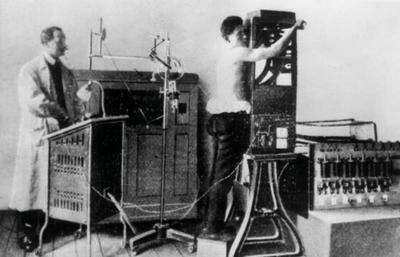 He set up a "department for the application of medical electricity" there two years later. After Wilhelm Rontgen announced his discovery of short-wave electro-magnetic radiation, Macintyre and Archibald Fauld set up X-Ray apparatus in Macintyre's laboratory and succeeded in photographing the bones of Macintyres hand. 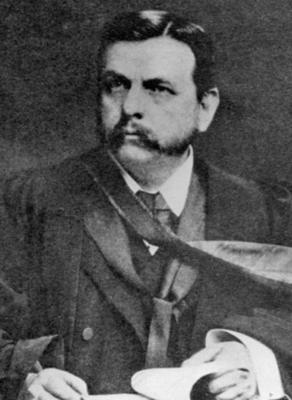 MacIntyre undertook further research with the electrical engineer James T Bottomley and with Lord Blythswood, presenting a ground-breaking paper "On Roentgen X-Rays, or the new photography" to the Philosophical Society of Glasgow in 1896, and he and his assistants made the first X-ray cinematograph, of the moving legs of a frog. 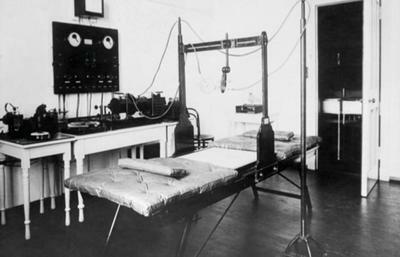 Macintyre set up the world's first radiology unit at the Royal, taking X-ray photographs of patients to assist in the diagnosis and treatment of injuries and illness, and in 1902 opened a purpose-built unit there. He produced the first instantaneous X-Ray, and the first X-Rays of renal stones and the interior of numerous parts of the body. Among many honours, he was President of the British Laryngological, Rhinological, and Otological Association in 1893 and 1900.